Dog Friendly: Sort of, if you trust your dog around drop offs they will do fine. We always make sure to keep Sal and Jedi leashed when at the top. 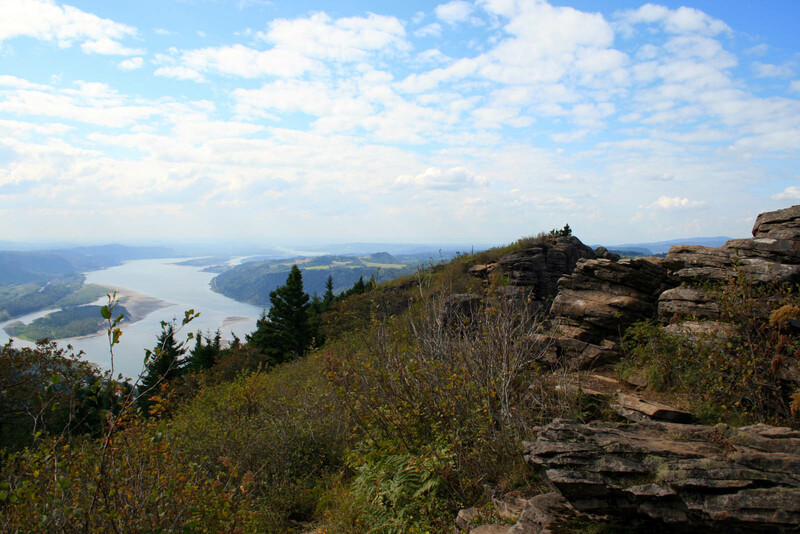 Angels Rest is one of my favorite hikes in the Portland area. It’s super close to town, it’s just long/hard enough to make you feel like you worked out, and the view on top is stunning. It’s a great escape from the city. To get there drive east on I-84 from Portland and take Exit 28/Bridal Veil. The trailhead parking is just to the right of the intersection with the Historic Columbia River Highway. The trailhead is marked and is opposite the Highway from the parking area. 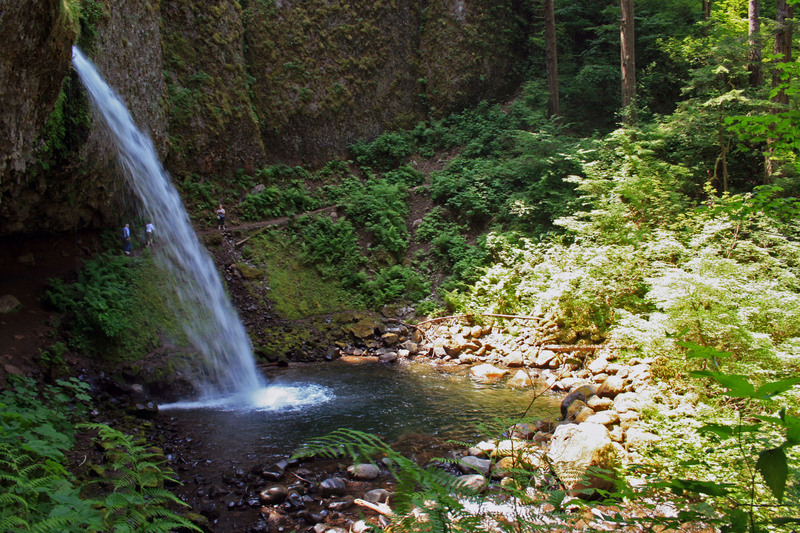 The trail begins with a fairly moderate grade, continuing through the trees with the occasional view of the Columbia River Gorge or Coopey Falls. After about a mile the trail begins switchbacking as the grade steepens. Wildflowers line the trail until you cross a rock slide, which means you’ve almost made it to the top. Yay! 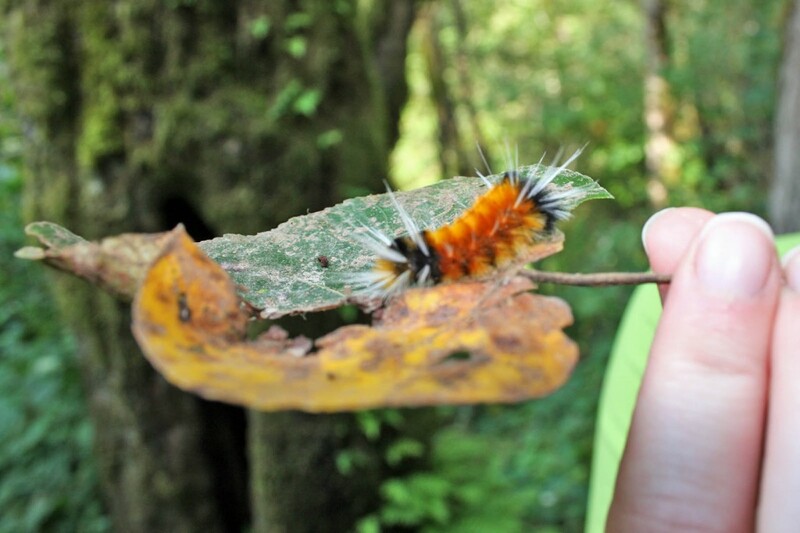 Caterpillar on the Angels Rest trail. All of that hard work and sweat will pay off. Follow the path toward the point, some easy scrambling will be involved, and enjoy the view. From Angels Rest you look across the river to Beacon Rock, Hamilton Mountain, and Table Mountain (which are all hikeable) and to the west you can see the Vista House. There is usually a nice breeze up top, so it’s a great place to enjoy the sunshine and eat your lunch before heading back to town. Although the hike itself is pretty moderate if you have creaky knees bring your trekking poles…you’ll be happy you remembered them on the return down. Steve swears by his Black Diamond Trekking Poles and uses them religiously…I however only use mine for trails that have miles of sustained downhill, so I didn’t pack mine and I was fine. 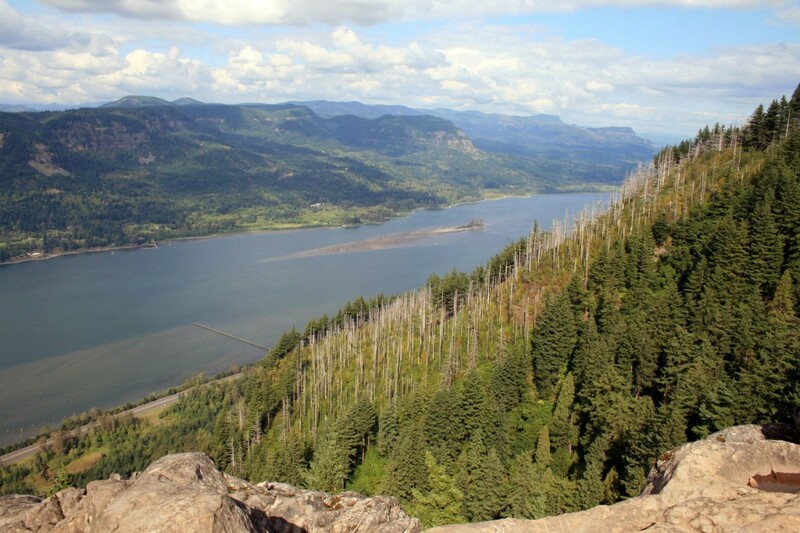 It’s also possible to reach Angels Rest from Wahkeena Falls, by doing the Devils Rest/Angels Rest Loop hike for a more challenging, longer day hike. After your hike head in to Troutdale and grab a beer at McMenamins Edgefield…. the service will be mediocre, but occasionally they’ll have a couple of good beers on tap…and the grounds are good for wandering. 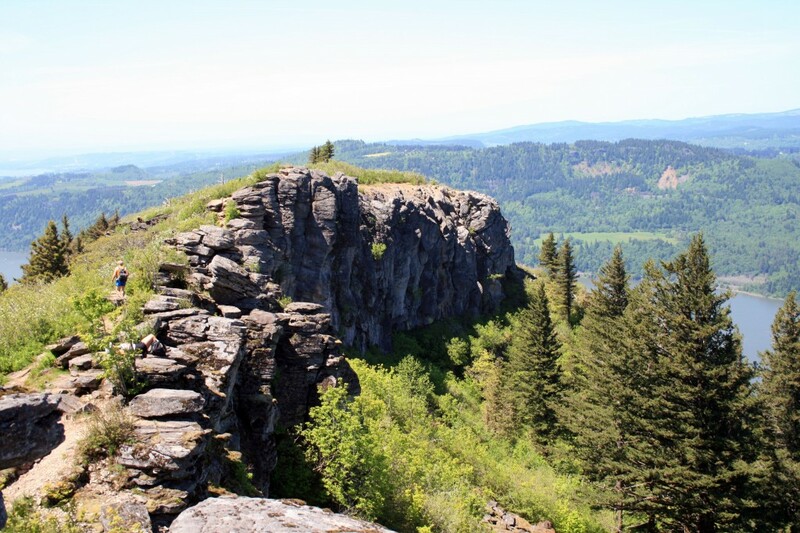 This entry was posted in Adventure, Oregon and tagged Angels Rest, Columbia River Gorge, day hike, dayhike, Devils Rest, hike, Historic Columbia River Highway, kid friendly, moderate, near Bridal Veil, near Portland by autumnadams4. Bookmark the permalink.